Today is a rest day; everything is being rested ahead of the Sheffield Half Marathon on Sunday. Turns out to be another wet day as well, so it wouldn’t have been much fun on the bike anyway. It doesn’t put L off walking up to meet me from the bus though, with the boys. Seems she’s desperate to try and wear them out because I’m not available to kick footballs tonight, even if it means walking them in the rain. I’m off out in Bingham, with four other chaps from the University days. I’m the only one who needs to be well hydrated for Sheffield on Sunday but they all keep me company at the bar. Our usual pub, The Horse and Plough, is quieter than normal and we put this down to the new Wetherspoon's, The Butter Cross, although the pub used to be called The Crown. 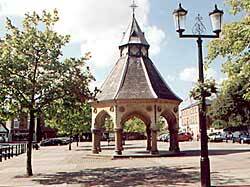 The Butter Cross being the 19th shelter in the centre of the market square. We go in there for the last one of the night but as usual I’m not terribly impressed. All Wetherspoons are cheap but not terribly comfy places to spend an evening and this is no exception. The Horse and Plough has been Bingham’s only decent pub for beer for years but it’s never had a particularly eclectic range of ales. Now it’s got some competition, they’ll have to up their game or else they’ll lose a lot of custom. The best beer we found tonight was in the Wetherspoons.